The living space of Museum Tower is designed from 8F up to the top story, 40F. Considering your comfortable and independent living space, the excellent design plan has been implemented, which creates corner rooms for all the residences. The living space is approximately from 50.2�uto 300�u. We provide you with a variety of floor plans to match your different lifestyles. ※The rent shown is for basic leasing plan. ※Please click here for availability. 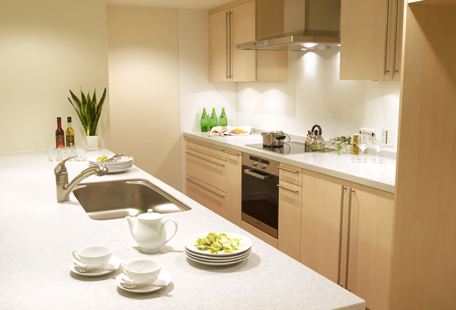 ※Please click here for Furnished Serviced Apartment page. With the theme of being fine, cozy and beautiful, the interior is urban, unified with a sharp natural design. In pursuit of high function in simplicity, adopting the system kitchen of "Hecker company" of Germany and the electric appliance of "Miele company" carefully selected equipment that supports high quality living. We deliver reliable quality and sophistication to our daily lives. *The indoor facilities listed will be the specification of the dwelling unit of the 16th floor or more. Equipment is different depending on the dwelling unit. Equipped with a system kitchen made in Germany "Becker" with a reputation for beauty and durability. The large kitchen counter of artificial marble is spacious and cooking is easy. A kitchen full of functional beauty has been realized that makes it easy to handle home parties and hospitality for adults at home. Space has room, so you can use it extensively. German "Miele company" product popular with excellent durability and functionality. We adopted a shower faucet for the kitchen of "Groe company". Built-in dishwasher of Germany "Miele company". Easy cleaning after hospitality with large capacity. Mantle hood made by Aria Feena whose sophisticated form is impressive. GE refrigerator that combines usability and functionality. It is a large capacity type with a convenient custom dispenser, ideal for families with many guests. A disposer that can easily handle garbage from home. Always keep sanitary water circulation. The functional system kitchen has plenty of storage space. The kitchen goods which tend to be increased clearly fits. 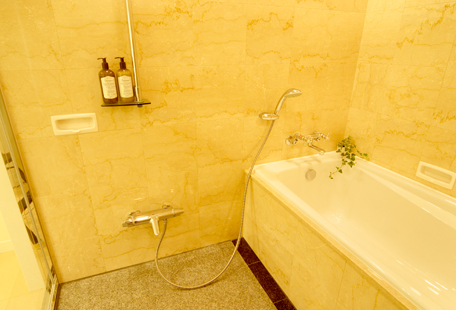 It is a custom-made bathroom by "No.1 water circulator manufacturer" in the United States "Kohler company". In addition to the large bathroom with soft coloring marble attached, the master bedroom has a separate private bathroom and it also fits foreign living style. It is convenient for guests to stay. A shower head suitable for a bathroom to heal the tiredness of the day. We set up a 2 bowl type washbasin that can be used simultaneously. Stylish tankless toilet with hand wash counter. Germany washing machine ・ dryer of 'Miele company' standard equipment. We have prepared products that combine functions with design. On the folded ceiling overflowing with luxury, we arranged indirect lighting with warmth. Various scenes can be produced by downlight which can adjust the brightness. If you open the entrance door, the marble pasted entrance welcomes you. Please enjoy the spacious space. Each bedroom has plenty of closet space to ensure wide storage. ll the living rooms are equipped with high-performance latest air conditioners. The living room is a built-in type that does not damage the interior. Replace the air inside the house with fresh outside air for 24 hours. Keeping the air clean at all times, preventing the occurrence of mold and dew condensation, ensuring a healthy living space. We installed fiber optic lines of eo home fiber in all residences and deployed LAN connectors in each room. High speed and comfortable internet of maximum 100 Mbps is possible. It is possible to receive e2by SKY Perfecenter, which allows easy multi channel viewing on digital TV. (* Application is necessary for viewing.) Separate fee will be charged.